The Mandatory Tariff Issue – The Follow Up and the Future – Implications for the Access Copyright v. York University Case. etc. On November 26, 2015 the Supreme Court of Canada (“SCC”) issued what may prove to be its most important copyright ruling to date in terms of its effect on tariffs, the tariff making process, the Copyright Board and the copyright bar. This involved the “mandatory tariff” issue, upon which the SCC ruled clearly and certain concerns regarding the Board’s power to issue retroactively binding decisions, of which the SCC provocatively took note. Needless to say, it could affect many other tariffs, and particularly the pending Post-Secondary tariff proceeding and the recently announced K-12 tariff, where it was not put in issue but may become an issue as I have suggested, if the school boards decide not to pay what they may regard as a greatly excessive rate. It arguably could and should have a profound effect on the way things are done at the Copyright Board, and how the Board’s tariffs are received by potential users. In particular, whether users treat the Access Copyright tariffs as mandatory will be very interesting. It will, hopefully, encourage the Board to come up with tariffs that are attractive and offer good value to users where collective activity is warranted and when compared to other unregulated alternatives. The result could enable such collectives to compete trough persuasion rather than coercion. It will hopefully encourage the Board to greatly expedite and lower the costs of tariff proceedings and to eliminate retroactively binding tariffs. He also noted in the very important footnote #2 that that the interveners (who I was proud to represent) had “raised concerns regarding the Board’s power to issue retroactively binding decisions in general”. The full twelve relevant paragraphs and the footnote are appended below. The ruling on the “mandatory” issue is no longer simply a theory held by Prof. Ariel Katz, Prof. David Lametti and me, who made the successful argument in the SCC. * It is now the law of the land. As noted below, some naysayers have argued and can be expected to continue to argue that the ruling that tariffs are not “mandatory” is restricted to the particular so-called but misnamed “arbitration” context of the CBC v. SODRAC case. However, in my view, they would be very wrong and very short sighted. The bottom line is that Copyright Board of Canada tariffs are simply not de jure (legally) mandatory or binding on users. Admittedly, some such tariffs may be de facto mandatory for practical purposes because there is no other better and cheaper way to achieve copyright compliance. For example, radio and TV stations that don’t want to restrict themselves to Bach, Mozart and other public domain music may have no practical choice other than to deal with SOCAN. SOCAN, for its part, has a virtually complete repertoire of all the music needed by radio and TV stations that is not in the public domain. Access Copyright, on the other hand, has a very limited repertoire in terms of what is needed by educational institutions and governments, who have many alternative ways and sources to clear their copyright needs. For those not familiar with or interested in the technical details of our argument in our SCC factum, consider this simple layperson’s analogy. 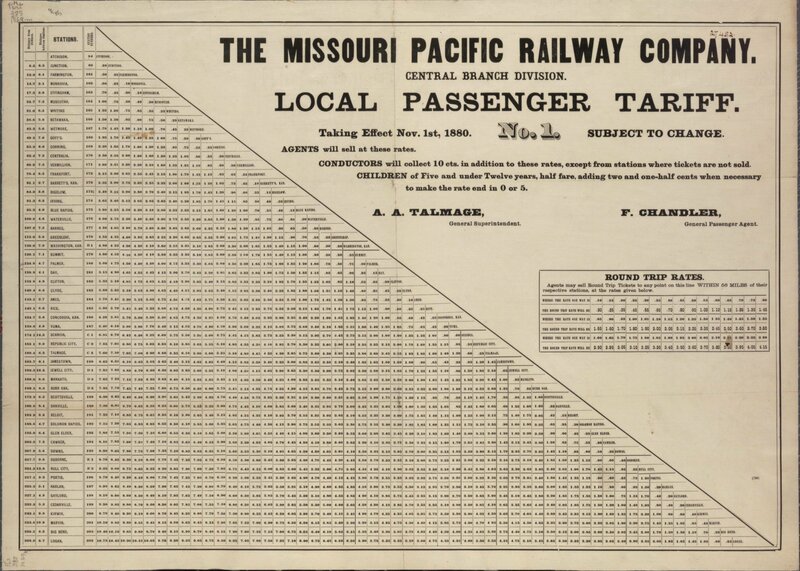 In the old days, there were “tariffs” for passenger travel on railroads. Such tariffs would set a maximum cost of, say $10, to travel from Ottawa to Toronto and required that CN Rail run four trains every day and stop in certain places, or whatever, etc. But such tariffs did not require the passenger to buy a Canada-wide all year pass for $3,000 if they only needed to travel to Toronto or Montreal or Smith’s Falls a few times each year. And above all, such tariffs did not prevent any passenger from using a plane, car, a Greyhound bus or even a bicycle to get there from here. That is how “tariffs” work. In return for some degree of privilege from the government, the regulated party providing the service and seeking to be paid must submit to upper limits on what can be charged and accept other terms and conditions, such as the nature and quality of services that must be offered. Moreover, except in very rare examples such as a sole bridge crossing with no practical alternatives, there are usually competitive substitutes available. Naturally, certain collectives and their lawyers and lobbyists can be expected to adopt the same tactics that were deployed for over a decade after the landmark 2004 CCH v. LSUC case – which might be called “Deny, Delay and Decry”. For example, certain collectives tried hard in 2011 in some of the Pentalogy cases to get the court to effectively reverse its landmark CCH v. LSUC ruling from just seven years previously. The attempt not only didn’t work but clearly backfired. Barry Sookman, a lawyer with McCarthy Tétrault LLP who is representing Music Canada as an intervener in the Supreme Court case involving CBC and SODRAC, said the argument put forth by Knopf and CIPP "doesn't have a shred of credibility to it." In a phone interview, Sookman said: "The Copyright Act is pretty clear that when the board goes through the process and it sets the rate, if you make a use that's within the [sic] what the board sets, you have to pay it." The example of universities potentially being subject to a hefty tariff regime as a result of accidental usage of certain materials is "greatly exaggerated," Sookman said. He said the Copyright Board has the flexibility to "say if you do X, you have to pay, or it can set a tariff based on how much you do X." In fact, s. 68.2 was specifically referred to twice in our SCC factum. It was clearly before the Court. MR. JUSTICE ROTHSTEIN: May I just -- in your last few seconds -- Mr. Knopf argued about the jurisdiction of the Board in imposing a licence on the user. Do you agree with his argument about the Board didn't have the jurisdiction to do that or how would you approach that? MR. CHISICK: Certainly not, Justice Rothstein. I disagree with that submission entirely. I think that it's founded on a misunderstanding of s. 70.4 of the Copyright Act, in particular, and the question of what exactly is voluntary versus what is mandatory. It's certainly clear that a user who doesn't make use of a repertoire has no obligation to pay for it. But it makes simply no sense in policy or according to the statutory scheme that a user who participates in a process before the Copyright Board those results in the setting of an arbitrated licence should then be able to walk away and say: No, thank you. I prefer not to pay for that. I'll just continue to make those copies and run the risk of being sued. It undermines the entire statutory scheme and renders it superfluous, in my submission. The Court clearly rejected Mr. Chisick’s submission. So, it would appear that, if a party to a so-called “arbitration” – which really wasn’t an “arbitration” in any normal or legal sense of the word – can treat the Board’s ruling as non-mandatory, then a fortiori, parties who are not involved in the “arbitration” mechanism and who are supposedly affected by the “general regime” and who may make a single copy of a single work in the limited repertoire of a collective in circumstances that may amount to technical infringement should not suddenly be liable for many millions of dollars for that one copy. For a university, that liability could amount to millions of dollars retroactively for several years – a possibility of which the SCC was clearly aware, if you read our factum and watch the hearing or read the transcript. That’s simply a ridiculous possibility – but it’s what some collectives and their lawyers, lobbyists or spokespersons want users and their often overly risk averse advisors to believe is still possible. Which brings me to the present and the future. Clearly, as with any SCC decision, we look to see the follow up and the future. The potential follow up and future are both potentially imminent in two pending matters. The first is the Post-Secondary tariff, which I have recently written about. That hearing concluded on January 22, 2016 but important comments were received afterwards on the mandatory tariff issue from UBC, U of T and other universities. York University put in a long comment but only indirectly and obliquely mentioned the mandatory tariff issue. See my blog. As for timing, the Copyright Board has, in the past, regularly taken two years or so after a hearing to render its decisions, which is virtually unheard of in other tribunals or courts in Canada. Hopefully, now that there is a new Chair in place and the issue of inexplicable delays in rendering decisions is now frontally in the public view as I have documented, we will have a decision in a matter of weeks or months (the norm is less than six months] and not years. Indeed, a decision in advance of the AC v. York U. trial beginning on May, 2016 could be potentially very useful in that context. Moreover, the SCC has clearly sent out a signal about retroactively binding decisions. Thus, the decision will hopefully come sooner rather than later. The next – and even more important – test will be in the Access Copyright v. York University litigation, which I’ve also had much to say about, for example here. That litigation is based upon the Copyright Board’s controversial Christmas Eve interim tariff of 2010, which the AUCC (now Universities Canada) took no steps to challenge on judicial review – although there arguably were ample grounds, as I explicitly suggested at the time. An application for judicial review of the interim tariff, had it been brought in January of 2010, might have precluded the very possibility of the current litigation against York University. And, as events have now shown, it might very well have succeeded at a very small fraction of the cost of the AC v. York U litigation, which will cost York and contributing institutions “hundreds of thousands of dollars, if not a million”, according to York GC Maureen Armstrong in an interview reported on December 29, 2015. York University is being represented in the AC litigation by the same firm that acted for AUCC during the Copyright Board Post-Secondary hearing, from which AUCC withdrew after having spent $1.7 million, as I have noted before. The firm is indeed extremely well experienced in copyright matters, having long acted for Re:Sound, one of the most important music collectives in Canada, the plaintiff law publishers in the CCH v. LSUC case, other major content owner interests. The firm took different positions on fair dealing at the Copyright Board in the Post-Secondary case and in the SCC in the SOCAN v. Bell cases as noted by Prof. Sam Trosow. Nothing I say here should be taken as critical of York’s law firm. What impact will the “mandatory tariff” ruling of the SCC in CBC v. SODRAC have on this litigation? Will this be presented as a threshold and fundamental issue at the trial? Is it still necessary for the Court to consider the apparently vast amount of evidence, including expert evidence, gathered in this case, to rule on York’s fair dealing guidelines, and to treat this as, in effect, a huge infringement action? It may be noted that AC lacks the legal standing to sue for copyright infringement as such, unless it joins the actual copyright owners – something that could raise all kinds of potential legal and political concerns. What will happen if York loses on the “mandatory tariff” issue, or another key issue such as fair dealing? Will it then appeal, thereby allowing potential interveners the opportunity to become involved, if the Court so permits? Was there an earlier opportunity to get a ruling on whether the case could or should go forward, if the “interim tariff” is not “mandatory”? If so, why has York taken no steps to date for a summary disposition of this litigation based upon the proposition – now a ruling of the SCC - that Copyright Board tariffs, and a fortiori, interim Copyright Board tariffs, cannot be “mandatory”? While the SCC ruled on this issue on November 26, 2015, the issue has been known about and written about for many years and before this litigation was commenced on March 8, 2013?. Prof. Ariel Katz laid out the gist of the argument quite publicly back in 2012 and tried, without success, to get the Copyright Board to deal with it in the Post-Secondary hearing. I have been writing about this innumerable times beginning even in December 2010 before the Board announced the interim tariff that is the basis of the current litigation and which AUCC did nothing to attempt to overturn on judicial review. I have long ago raised the question of whether it might have been possible to attack the pleadings at the outset on this issue. Could the York lawsuit have been entirely prevented if AUCC had sought timely judicial review back in January of 2011, as I explicitly suggested at the time, when such review would have been inexpensive and stood a good chance of success? While York has raised the issue of whether the “interim tariff” is mandatory, what is its position on a final certified tariff? The pleadings are silent on this point. Was it inevitable that York’s fair dealing guidelines go on trial? If so, will York be able to benefit from the Copyright Board’s extensive reasoning on fair dealing in the Provinces and K-12 decisions? Was it inevitable that experts, surveys, and other massive amounts of evidence be dealt with at the first phase of a bifurcated hearing if tariffs are not mandatory? Was it necessary for York to submit to such massive discovery, which has led to prolonged, extensive, and expensive proceedings that has threatened to be disruptive to a large community at York and even led to a policy grievance by the faculty association arising from a “Document Preservation Notice” sent by York’s former General Counsel to YUFA members? 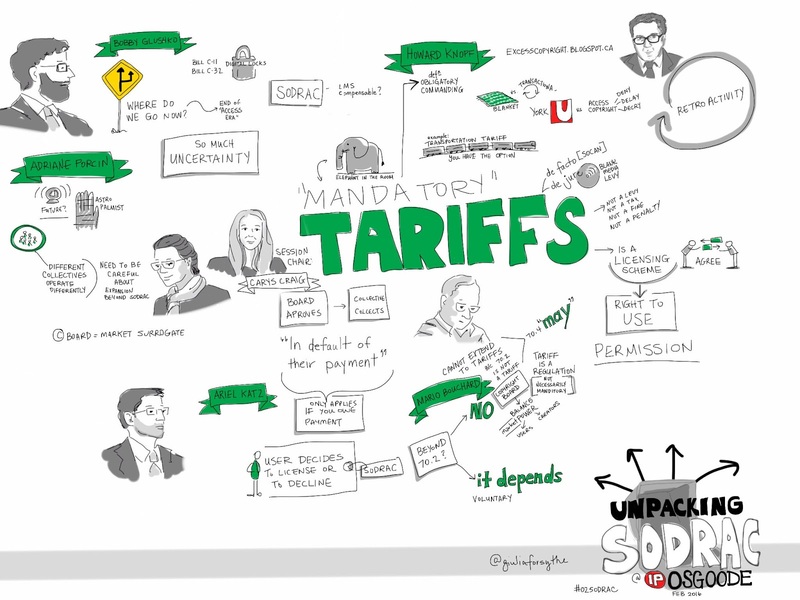 There was an interesting discussion on February 25, 2016 about the “Mandatory Tariff” theory and some of the above issues at York University at the Osgoode Hall/U of T “UNPACK SOCRAC” conference on February 25, 2016. Unfortunately, as I understand, the organizers of the conference were unable, for whatever reason, to persuade any official of any collective or any of their outside counsel to participate on this panel. * I was honoured to represent at the SCC the Interveners Prof. Ariel Katz and the Centre for Intellectual Property Policy (then under the direction of Prof. David Lametti, who is now David Lametti, M.P. and Parliamentary Secretary to the Minister of International Trade). It was our submissions that persuaded the Court on the above issues and which are reflected in Justice Rothstein’s reasons. Here’s our factum. Here’s the video of the oral argument, wherein our submissions on the mandatory tariff begin at the 152 mark and consisted mostly of an interesting interchange between me and Justice Rothstein that presaged the eventual ruling. Our submissions on the retroactivity issue in response to a question from Justice Karakatsanis begin at 163 and took us into overtime. Once again, the interchange presaged the result. The Copyright Board’s K-12 Tariff: Good, Bad, Retroactive, Mandatory? A Seven Year Itch? The Copyright Board’s K-12 decision for 2010-2015 was released on February 19, 2016. The tariff was filed on March 31, 2009. The hearing took place in May, 2014. Now, almost two years after the hearing and almost seven years after filing, we finally have a decision. Naturally, it is retroactive back to 2010. It is 172 pages long, which puts it in the top three or so of the Board’s longest decisions. Here is the actual Tariff. The rates certified by the Board are $2.46 per student per year for the period 2010-2012, and $2.41 per student per year for the period 2013-2015. The amounts of royalties that are likely to be generated by the tariff the Board is certifying are $9.5 million per year for the period 2010 to 2012 and $9.3 million per year for 2013-2015. While the amounts may appear reasonable on the surface, we are disappointed by the Board’s decision, which establishes a troubling framework for determining the fairness of copying behaviour in schools and dismisses the value of much of the content that is used. The Board estimated, for example, that schools covered under the tariff copied approximately 195-million pages from books in Access Copyright’s repertoire each year. In its tariff valuation, however, the board excluded 87% of that copying, or approximately 179-million pages. That means creators and publishers of books are going uncompensated for copying of an amount equivalent to approximately 897,300 books, annually. We are concerned this decision will further diminish the incentives to publish at the same time as it creates a compelling incentive for K-12 decision-makers to rely, even more, on copying as an alternative to purchasing content. The announced tariff rates are lower than the per-student rates requested by Access Copyright of $15.00 for the years 2010–12 and $9.50 for the years 2013–15. However, the consortium had sought a lower rate. Eleven years ago, Access Copyright filed a tariff seeking $15 for each full time equivalent employee from provincial and territorial governments. Its ship has now come home. But spoiler alert: the ending was not a happy one for Access Copyright. The ship was not full of riches as expected. Instead, the Copyright Board has awarded only 11.56¢ - that's indeed ¢ and not $ and not a typo - per employee per year or 0.0077, i.e. less than 1%, of what Access Copyright asked for. That is for the period of 2005-2009. The rate goes up to 49.71¢ per employee for 2010-2014. But that is in turn only about 2% of the $24 per employee that Access Copyright asked for. This arguably much too high rate may be due at least in part to CMEC’s reliance on the same problematic “Volume Study” it used in the last 2005-2009 hearing that was already seriously flawed at the time by their own admission because, as I suggested in 2009, the Educators had agreed at an early stage of those proceedings to a survey methodology that resulted in evidence that by their later admission “needs to be collected differently” in light of the 2004 CCH v. LSUC case, even though it was obvious at the outset in 2005 that the landmark CCH decision could and should affect what happens in Canadian schools. Perhaps a new Volume Study that asked all the right questions might have been a good investment. However, it clearly would have been expensive and intrusive once again. Perhaps the Board should force – or regulations should require – that tariff applicants bear the entire cost of such studies. But that is a topic for another day. In any case, there is a much more immediate and cogent, though not unrelated, reason why the rate is so high, as explained below, concerning so-called “consumables”. BTW, that 1998 $2.10 rate adjusted to inflation according to the Bank of Canada would now be just under $2.94. Intuitively, based upon the Supreme Court of Canada jurisprudence and the 2012 legislation, the K-12 tariff should be MUCH lower than that, not just $0.48 cents lower. Indeed, recall that that the $2.10 rate negotiated in 1998 predated the landmark CCH fair dealing ruling, which the school boards have been slow to assimilate and we now have the 2012 pentalogy decisions AND the addition of “education” to s. 29 of the Copyright Act. It will also be recalled that the 2005-2009 tariff was set at $5.16, which was later reduced to $4.81 following the Province of Alberta decision from the SCC in 2012. That amount of $5.16 was arguably much too high, as I suggested at the time. Both sides express concerns with the Board’s reasoning. Overall, there are some good legal findings in the current K-12 decision, from the standpoint of public policy. CMEC is to be commended for bringing about a better understanding of fair dealing in the context of education and the Board is to be commended for adopting what were presumably many of CMEC’s arguments. The Board seems to have finally refused to include works of non-affiliated rights owners – which AC had tried to include by sending out cheques to sometimes bewildered recipients whose names somehow appeared in AC’s database and received a small cheque out of the blue (para 158). There is growing scepticism by the Board re inclusion of repertoire from foreign RROs (para 165). The Board refused to go along with inclusion of sheet music in the tariff, since the volume in evidence was too low to be reliable – and suggests a transactional tariff, but nobody proposed one (paras 186, 187). There is no indemnity provision in this tariff. (para 185) The indemnity provision was always highly problematic from a legal standpoint – as I have questioned for many years. That said, it was comforting to users, if they did not ask too many inconvenient questions, such as whether AC was providing an unlicensed insurance scheme. For longer works, such as books, guided by the Supreme Court’s decisions in CCH, Alberta, and Bell, we use the following approximation: where the amount of a work copied was less than or equal to 5 per cent of the work, we conclude that the amount copied tends to make the dealing fair; where the amount copied was more than 5 per cent but no more than 10 per cent of the work, we conclude that the amount copied did not affect the fairness of the dealing; where the amount copied was greater than 10 per cent of the work, we conclude that the amount copied tends to make the dealing unfair. With respect to goal, we find that 100 per cent of dealings for books tend to fairness. This is because there are two underlying goals—private study and education—that cover all the copying that takes place in the educational context. With respect to amount of the dealing factor, and as explained above in Part XIII.F above, we apply the following rule. If fewer than or equal to 5 per cent of the pages in the work were copied, the dealing tends to fairness. If more than 10 per cent of the pages in the work were copied, the dealing tends to unfairness. The intermediate interval has a neutral tendency. That can be seen as a vindication of CMEC’s fair dealing guidelines, which some had thought that the Board would not treat with great sympathy. Whether the Courts will agree may be another matter, which may get addressed in judicial review of this decision and perhaps much sooner in the AC v. York U case, which I’ll have more to say about another day. So, Why All the Right Reasoning and Resulting Surprisingly High Rate? The Board did some interrelated things that could render its decision susceptible to judicial review (aka “appeal”) – with a result that is not easy to predict that this stage. First, it apparently was not happy with the approach of either side on fair dealing and decided to embark upon a methodology of its own without giving the parties an opportunity to comment. It also decided, in contrast to the previous tariff, to included “consumables”. We generally proceed with our calculations in the same manner as the parties, by determining the number of copies that were made for a permitted purpose, and, of those, how many were fair. However, in order to use the aggregate information in evidence, we must make the assumption that the characteristics of copying (such as the goal of the dealing, the amount of the dealing, or nature of the work) are independent of one another. For example, whether a copy is made for one purpose or another, the amount of the work copied is not dependant on the purpose. This assumption is necessary, since the data that was adduced by the parties from the Volume Study does not let us correlate such characteristics with one another with any confidence. Given that the information in relation to consumables, which were not compensable under the K-12 (2013) decision, is also drawn from the 2006 Volume Study, and was also provided to the Board in aggregate form, we use the same method for approximating the amount of fair dealing in relation to consumables as well. The full methodology and calculations are discussed in Part XVI.E and in Appendix B. The methodology is of our own design, inspired however by submissions of the parties, particularly those of the Objectors. The calculations use data that is part of the evidence. Our assumptions and inferences are also based on the evidence. Because we are of the opinion that the parties did not adequately address fair dealing, we had no choice but to fashion a methodology of our own. The use of our own methodology raises the issue of whether or not we should submit it to the parties for comments. We decline to do so, for three reasons. First, allowing the parties to comment on the methodology issue would introduce several months of needless delay. We believe that the record is complete enough as it is. Second, the methodology is fundamentally based on the six-factor legal framework from CCH. This is a well-known framework, on which the parties have already commented extensively. Finally, the methodology uses data found in the evidence. The later has been extensively examined and cross-examined by the parties. The decision to make CMEC members now pay for the consumables that were excluded in 2009 appears to be based upon AC’s inclusion this time of the item in its proposed tariff. CMEC did not object per se, but appears to have argued mainly about how much of the copying of consumables should be worth. The data for the consumables calculation came from the less than satisfactory 2005 Volume Study. It is not evident in the decision exactly what was considered in the Volume Study to be a “consumable”. for a single use and that may not be reproduced. students will result in remuneration. The Board seems to have dropped the “intended for a single use” component of its 2009 definition of "consumable". The “consumables” development is potentially very troubling. It will be trivially easy for publishers and everyone else to include such an explicit statement in every document, whether it be a workbook, a web page or a long history book. Indeed the copyright pages of many, if not most, books already contain such as statement. I’m looking right now at the copyright page to my handy Carswell compilation of Canadian IP statutes, which contains the remarkably incorrect statement that “No part of this publication may be reproduced, stored in a retrieval system, or transmitted … without the prior written consent of the publisher (Carswell)” And that’s a book of statutes, for goodness sake! (Sorry Carswell – you are my publisher but you shouldn’t include this over-the-top boiler plate!) Even Sam Trosow and Laura Murray’s excellent book contains such a statement, which I am sure Sam and Laura never intended to be the case. This kind of boiler plate may frighten some timid librarians and even timid copyright lawyers. The Copyright Board should not take it at face value, and have given no compelling reasons to take it at any value. 49 As an integral part of the scheme of copyright law, the s. 29 fair dealing exception is always available. 70 The availability of a licence is not relevant to deciding whether a dealing has been fair. As discussed, fair dealing is an integral part of the scheme of copyright law in Canada. Any act falling within the fair dealing exception will not infringe copyright. If a copyright owner were allowed to license people to use its work and then point to a person’s decision not to obtain a licence as proof that his or her dealings were not fair, this would extend the scope of the owner’s monopoly over the use of his or her work in a manner that would not be consistent with the Copyright’s balance between owner’s rights and user’s interests. Leaving aside the fair dealing analysis, it is not clear what exactly formed the basis of the “consumables” calculation at the end of the day in terms of what types of works were included, or the criteria for classifying them as consumables. It all appears to trace back to the flawed 2005 Volume Study – but if that is so, why should the Board have relied on such evidence? However, if one follows (or tries to follow) the Board’s reasons and calculations, it becomes apparent and is summarized in Table 35 that 79% of the FTE rate of $2.46 is attributable to “consumables”. Without the new and unexplained inclusion of "consumables", this tariff would be worth only less than $0.46 per FTE, in other words just about exactly what CMEC had suggested at the outset. See also paras. 308, 309, 349, 350, 445, 446 – 448, 477, 487, 499. Why Did the Board Not Consult the Parties About its “Methodology of Our Own”? The reference to a potential delay of “several months” (para 351) if the Board were to have afforded the parties an opportunity to comment on the new methodology is nothing if not ironic. This tariff is retroactive by six years. The Board took almost two years after the hearing to render this decision. That is an extraordinary, inexplicable and frankly very problematic result compared to other Canadian courts and tribunals. Another few weeks or months would hardly seem to make a difference after seven years. In any event, why it would take the parties “several months” to respond is not clear. Courts routinely ask parties to respond to important questions on the Court’s mind that may not have been considered by the parties on the spot, or overnight. The real question is why it took the Board so long to come to “the opinion that the parties did not adequately address fair dealing” at the hearing, or indeed in their statements of case. Indeed, if the Board’s decision - to unilaterally go off on its own on a fundamental issue long after the hearing was over and not consult the parties - results in judicial review, whether or not successful, another year at least will be added to the retroactive effect of this tariff. It could even be a much longer, if the Federal Court of Appeal remits the matter back to the Board – and far longer still if the matter ends up in the Supreme Court of Canada. Moreover, an old issue is suddenly back and potentially in the foreground. This is the very fundamental jurisdictional question of whether the Board can even render such retroactive rulings, concerning which see more below. Spoiler alert: the “retroactivity” issue is now clearly on the Supreme Court of Canada’s radar screen. This could be a game changer. The new Chair of the Board was not involved in this proceeding, which has been almost seven years in the making, including almost two years since the hearing took place. The former Chair, Justice Vancise, was seized of this case and has had it under reserve, along with his colleagues, for almost two years since his retirement from the Board. Chairman Vancise’s term as Chair ended on May 13, 2014, which came just after the hearing in this case concluded. The statute allows a retired member to conclude matters that the member “has begun to consider”. Unlike the Supreme Court of Canada, for example, there is no stated time limit on how long this may take. That is not a ruling. But it is a clear signal that the Supreme Court has this issue on its radar screen. The retroactivity issue was raised in my clients’ factum. The Court’s interest was very clear at the hearing. Watch at just before the 163 point in the webcast of the SCC hearing where Justice Karakatsanis raised this issue, which extended our intervener oral submission into overtime. I think the better view is I that it is an implied duty of the Board to proceed with all possible expedition and that the statements if certified later than January 1 relate back upon certification to the commencement of the year. Surely “all possible expedition” doesn’t mean almost seven years. It will be interesting to see whether, if CMEC seeks judicial review, the retroactivity issue will be raised. There appears to be at least $55 million at stake for the previous six years. I shall have more to say about the retroactivity issue another day. For the moment, suffice to say that the Seven Year Itch phenomenon may be setting in. Above all, the elephant in the room for all concerned in the educational sector in particular – and apparently not addressed here by CMEC or the Board – is the overwhelmingly important question of whether the Board’s tariff is “mandatory” in any sense at the end of the day. If it is not, and if the school boards and other major sources of revenue for AC find a better and cheaper way of copyright compliance and stop paying AC as if it were mandatory, AC will have a major existential problem. According to the Supreme Court of Canada in the SCC’s recent CBC v. SODRAC decision, as I understand the reasoning and it was indeed yours truly who successfully argued this very issue, it is not mandatory as far as the school boards are concerned. Naturally, I reiterate, as I do from time to time and is always stated on my “masthead”, that my views on this, or any other topic on this blog, are not to be taken by anyone as a legal opinion or advice for any purpose. Readers should consult their own counsel – and in any event read for themselves the Supreme Court’s copyright decisions. The Court’s copyright decisions are very clear and comprehensible, even to non-lawyers. One senses that the Court is very aware of the public policy implications of these decisions and wants the public to read the reasoning directly and that this is why these decisions are written in a particularly eloquent and direct manner and perhaps even more so than the Court’s generally very lucid judgments. If, as is absolutely clear in the CBC v. SODRAC decision, a Board tariff is NOT mandatory as concerns a party that becomes involved, as a result of failure to reach a royalty agreement, in the so-called (but misnamed) “arbitration” procedure under s. 70.2, why would it then be “mandatory” for countless school boards who were forced to appear before the Board because this was under the Board’s “general regime” set forth in Sections 70.1 to 70.191 of the Act? If anything, the case that a general regime tariff is not mandatory seems even more obvious than under the so-called “arbitration” regime of s. 70.2. Even if the CMEC consortium didn’t raise the issue of whether the tariff could and should be “mandatory”, that doesn’t mean that this tariff is mandatory. The Supreme Court’s ruling in CBC v. SODRAC predated this Board decision by about three months. While the Board has asked numerous parties to comment on the technological neutrality aspects of this decision, it has not done so with respect to the “mandatory tariff” aspect. When the Supreme Court rules, its decisions are effective immediately, unless the Court says otherwise (notably in Charter cases where time may be needed to amend or adjust). It is somewhat surprising that neither the Board nor the objectors took any steps to assess the impact of the “mandatory tariff” ruling on this case. Likewise, as I have noted, there was not discussion of this issue in the Post-Secondary hearing that concluded on January 22, 2016. The issue of “mandatory tariffs” and how it was dealt with in a conference at Osgoode Hall Law School on Thursday, February 25, 2016 where Ariel Katz and I explained why, in our view, tariffs such as this are NOT mandatory. This should be available soon on the web – I’ll let folks know when. Here are the Power Points. Anyway, what Ariel and I and David Lametti, who was part of the team with Ariel and me and is now an M.P. and Parliamentary Secretary to the Minister of International Trade, argued and believe doesn’t really matter anymore. What matters is what the Supreme Court of Canada said. And what the SCC said, in Justice Rothstein's last and legacy copyright decision before he retired, is very clear. On this issue, there was no dissent. It will be interesting to see if school boards regard this tariff as mandatory on a going-forward and/or retroactive basis. AC’s much vaunted and commissioned PWC study suggests that the school board’s payments have indeed stopped as of January 1, 2013. See page 23. The Board is finally getting around to correcting some of its prior misunderstandings on issues such as repertoire, implied agency, insubstantial copying, and some aspects of fair dealing. Under the hypothetical scenario where creators would cease to receive royalties from Access, 60 per cent of respondents indicated that this would have no impact on the number of works they create, and 23 per cent indicated that they would reduce the number of works they create. Since the majority would continue to produce works even when no royalties are paid, this suggests that Access royalties do not have a strong effect on creator future output. That said, mostly because of the lengthy but not readily understandable reasons and conclusions concerning “consumables”, the rate is about five times higher than one might have expected and what CMEC had asked for. Indeed, governments and taxpayers may notice that this rate is about five times higher than the Provincial Governments rate for 2010-2014 and about 20 times higher than the Governments rate for 2005-2009. It is exceeding difficult to get findings of fact, especially those involving detailed calculations, overturned on judicial review, unless they are in turn based upon an underlying misunderstanding of the legal principles – as was the case in the SCC Province of Alberta decision. That said, both sides here have much to be concerned about and judicial review seems quite possible, which could add at least a year and possibly much more to the uncertainty and potential retroactivity depending on the outcome. Because there is no “cross-appeal” process in judicial review, it would not be surprising if both sides file at the same time – which will be on or before March 21, 2016 by my calculation. In any case, if CMEC members conclude that whatever tariff the Board has certified or may certify in the future after a rehearing may be safely ignored if there are better and less expensive ways to be copyright compliant because such a tariff is not “mandatory”, either on a going forward or retroactive basis, then many if not all of these issues will become effectively moot for practical purposes. CMEC might still file a judicial review application to keep its options open. It might be content with a tariff in the $0.46 per FTE range. This particular decision has left both sides apparently unsatisfied. That does not necessarily mean that it was decided with the Wisdom of Solomon. It exemplifies both the positive and problematic aspects of the Copyright Board process. What happens now is uncertain. We may have more insight by the end of the day on Monday, March 21, 2016 if one or both sides seek judicial review. In general terms, the SCC’s ruling on “mandatory tariffs”, the SCC’s recognition of the retroactivity issue and the possibility of recovering money paid in the past under tariffs that become questionable in the light of subsequent jurisprudence (see Rogers slow motion struggle to recover ringtones money paid to SOCAN) add to the uncertainty facing the Board and its stakeholders. All of this may keep a small cadre of lawyers very busy, but it seems that the actual stakeholders on all sides are starting to ask some very fundamental questions and are becoming impatient or simply withdrawing from the process. Meanwhile, correction continues to come from the Federal Court of Appeal, for example this decisions just before Christmas on procedural fairness from Justice Nadon in the Netflix case on which I commented. Unless the Government gets decisive and decides to devise and implement regulations governing the Board, its procedures and its stakeholders, one can expect that these issues will loom large, if not dominate, the 2017 review process.